WHAT IF last Friday night at Progressive Field, the heroics didn’t belong to the Cleveland Indians baseball team? WHAT IF the two out rally wasn’t started by Grady Sizemore or Travis Hafner? WHAT IF this time…this one time, the victories didn’t belong to the Tribe team that everyone is used to and instead belonged to the Cleveland Indians kickball team–made up of members of the Cleveland Indians front office? I’m glad you asked! The competition was fierce that day, my friends. I’ll tell you the opposing players were 10 feet tall if they were a foot! But that didn’t matter to us. We simply looked at our enemies and smiled, because we knew–we knew we had the Cleveland Indians “bat magic” on our side. We had the likes of Dan “Asdrubal” Badders at short stop making unbelievable defensive plays to help out our pitcher Ashley “Pure Rage” Churchill. We had a core team of veterans named Machado, Walters, Janoso, Frohwerk, Sherman and Polito showing the rookies how its done. And most importantly, we had the “never-give-up/two-out-rally” attitude that has created so many memories for our fans this year on the baseball side of things. Game 1 and 2 were easy victories for us and got the juices flowing. We knew going into Game 3 we would need great defense and even faster legs. We played smart ball, but still found ourselves down 1-0 early on. We came back to tie it up 1-1 in, what we thought would be our last ups. Time still remained and we were able to get one last at bat and that is where the magic began. In the bottom of the 3rd inning (the last inning), the Indians came back to win it 2-1! The opposing team was not happy thinking that they lost on a technicality. Umpire’s call–we win and we move on. Game 4 was just as intense. We were again down 1-0 in the 1st inning. No matter what we tried to do, we were going down 1, 2, 3 until the 3rd inning (again). That’s when the rally began. We battled back to tie it up. Then, with two men on and two outs we kicked a solid single. Dan Badders, on second base took off to third and then tried for home to get the win. The ball was thrown and clearly the catcher did not tag our runner. The umpire had a bad angle and didn’t know what to call. She called out and then safe and the complaints piled in. There was no way for her to make it right and, because this was a game for charity, both teams agreed that a re-kick was the most fair option. The rally continued as we ended up scoring to win the game 2-1 and move on to the Championship game versus KeyBank. I’m not even going to go into details of this game because every fan watching has their own take on how it all went down. That’s how legends are created, and that’s what this battle will go down as–legendary. Some will say we had it in our grasp from the first kick, others will say that KeyBank should have come up with the victory (those people would be wrong). 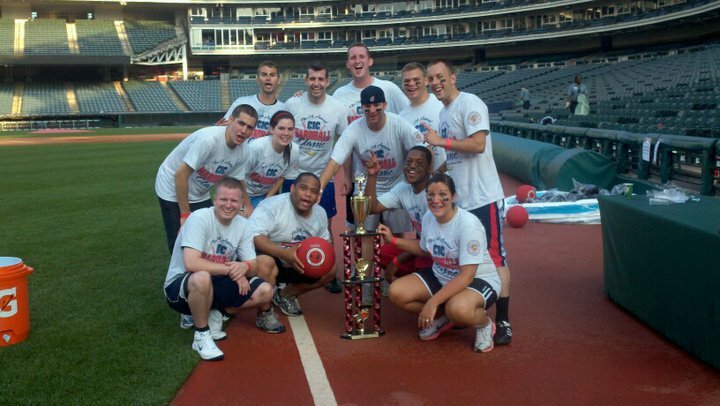 Knowing the game was all for charity, the Cleveland Indians reached deep down into their guts and pulled out the greatest win of all time to became the first back-to-back kickball champions in the world! The kickball games were played as part of the 2nd Annual “Cleveland Kicks-It”–a charity kickball tournament to raise money for an organization called Kick-It. Kick-It is a national fundraising program that raises money for children’s cancer research through the game of kickball. Cleveland Kicks-It brought local Cleveland businesses together to compete against each other at Progressive Field in a double elimination tournament. Competing teams included the Cleveland Indians, Cleveland Cavs, Rosetta, KeyBank, American Greetings, Clear Channel, Quicken Loans, K&D Group, Kalman + Pabst, West Side Challenge and Fairmount Minerals.